How can the Block Problem Happened During the Work of Sand Maker Be Dealt With? Sand making equipment is indispensable equipment in building construction. It is the source of sand and gravel aggregate, and also is the foundation of all buildings. Sand maker plays an important role in our daily life. But during its working period, the block of it often happened. What can we do to solve that problem? Firstly we should do it from the source. In its normal production process, we should control feeding speed, and choose a suitable transfer machine, that can greatly solve the blocking problem. 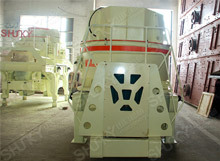 In recent years, Shanghai Shunky has strived to research sand maker. Its product—VSI sand making machine and 6S sand making machine has been improved greatly in their performance. The increase of technology has brought a certain of convenience to production. avoid congestion sand making machine, we should from the source control. Damage and aging are also the things we should regularly check. And unsuitable parts need be fixed or changed timely. The two new sand makers we talked above represent another breakthrough of sand maker. They are more suitable to meet production requirement. Shanghai Shunky can do timely research and design according to customers demand, and provides them the most suitable products.